Last weekend, my mom and I hit up Lowe’s (on Sunday afternoon.) My goal was to exchange a faucet and I not only exchanged the faucet, but I ended up buying 36 petunia plants. The six-packs were clearanced for 25 cents, and I apparently couldn’t stand to see the flowers go to waste. Sadly, they sat on our stone wall in the driveway for just under a week. I noticed them Friday night when I was finishing some things in the vegetable garden, and I decided to go ahead and plant them. 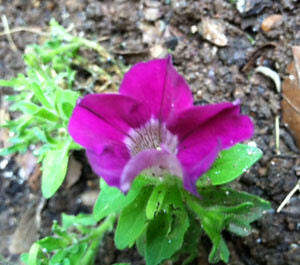 The flower beds on our stone wall were great for petunias last spring. The flowers lasted for a long time. I’ve been trying to get the creeping phlox to creep a little more (it’s slowly, but surely spreading) so I don’t have to worry so much about flowers there. 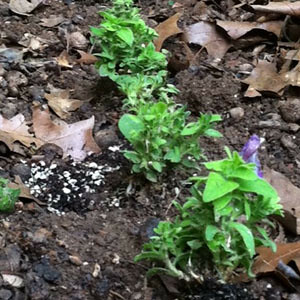 I ended up planting 5 of the 6 packs of petunias along the wall. One pack was saved to go at the base of a clematis flower I also rescued from Lowe’s. jay bought a bunch on sale too – he wanted to make the end of the brick path pretty to take pictures for when he lists the house.